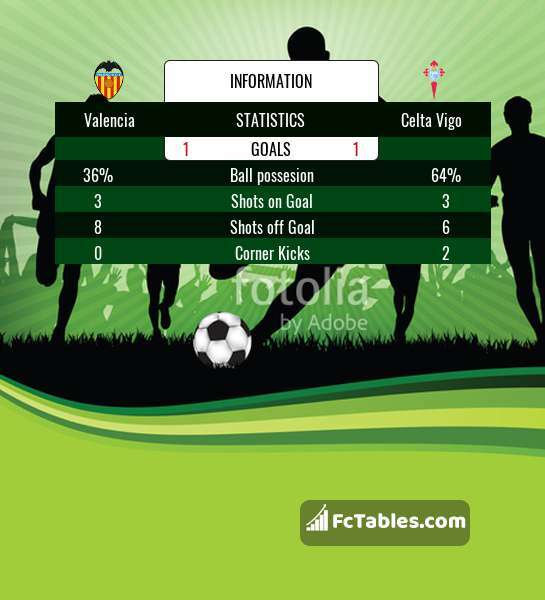 Kick off Valencia-Celta Vigo in La Liga on today 20:00. Referee in the match will be Ricardo De Burgos. Team Valencia is located in the middle of the table. (15 place). Last 5 games (league + cup) finished balance 4 points. From 3 matches no lost a match. Players Valencia in La Liga with the highest number of goals: Daniel Parejo 1 goals, Denis Cheryshev 1 goals, Rodrigo 1 goals. Injuries in the team Valencia: Santi Mina. Team Celta Vigo is located in the middle of the table. (7 place). Form team looks like this: In the last 5 matches (league + cup) gain 8 points. From 2 matches can't win a match. In this season games La Liga the most goals scored players: Iago Aspas 4 goals, Maximiliano Gomez 3 goals, Pione Sisto 1 goals. They will have to be well guarded by defense Valencia. Most assists in the club have: , Maximiliano Gomez 3 assists, Pione Sisto 1 assists. Direct matches: Valencia won more direct matches. 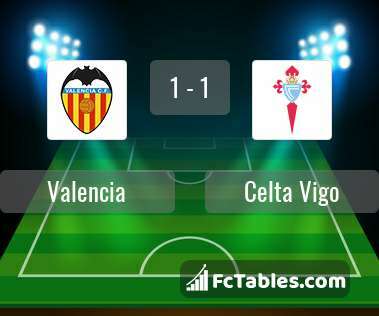 Valencia won 11 matches , Celta Vigo won 8 direct matches, was a 9 draws. In 12 matches the sum of the goals both teams was greater than 2.5 (Over 2.5), and 21 matches teams scored more than 1.5 goals (Over 1.5). In 18 matches the both teams scored a least one goal (Both teams to score).